Home Environment Green India Mission National Harit Bharat Mission The details of progress made in implementation of Harit Bharat Mission. Harit Bharat Mission The details of progress made in implementation of Harit Bharat Mission. STATEMENT REFFERED TO IN REPLY TO PARTS (a) TO (d) OF THE LOK SABHA STARRED QUESTION NO. 248 BY SHRI MANSHANKAR NINAMA REGARDING ‘HARIT BHARAT MISSION’ DUE FOR REPLY ON 28-12-2018. 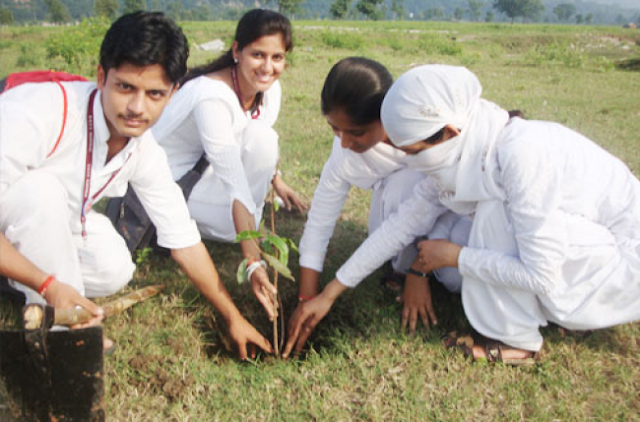 (a) National Mission for a Green India (GIM) is one of the eight Missions under the National Action Plan on Climate Change. It aims at protecting, restoring and enhancing India’s forest cover and responding to Climate Change. GIM activities were started in the Financial Year 2015-16. The State Governments are required to furnish Annual Plan of Operations (APOs) based on their own planning for each financial year. It is an ongoing scheme and the annual targets in respect of each State is determined on the basis of the approved Annual Plan of Operations (APOs) and the availability of funds. The State wise details of the achievements against the targets sanctioned is placed at Annexure-1. (b) A total amount of Rs. 200.76 Crore has been released to twelve states so far under the scheme. The State wise details are placed at Annexure-2. (c) & (d) Convergence Guidelines of GIM with Mahatma Gandhi National Rural Employment Guarantee Scheme (MGNREGS) and Compensatory Afforestation Fund Management and Planning Authority (CAMPA) were issued in March and May, 2015 respectively. REFERRED TO IN REPLY TO PART (A) OF THE LOK SABHA STARRED QUESTION NO. 248 BY SHRI MANSHANKAR NINAMA REGARDING ‘HARIT BHARAT MISSION’ DUE FOR REPLY ON 28-12-2018. Note: * Fund were revalidated for utilization in FY 2016-17 and FY 2018-19. The achievement will be reported in next financial year. REFERRED TO IN REPLY TO PART (B) OF THE LOK SABHA STARRED QUESTION NO. 248 BY SHRI MANSHANKAR NINAMA REGARDING ‘HARIT BHARAT MISSION’ DUE FOR REPLY ON 28-12-2018.